[two_third]You're a tourist in Singapore looking to try some of that chicken rice you've heard of. 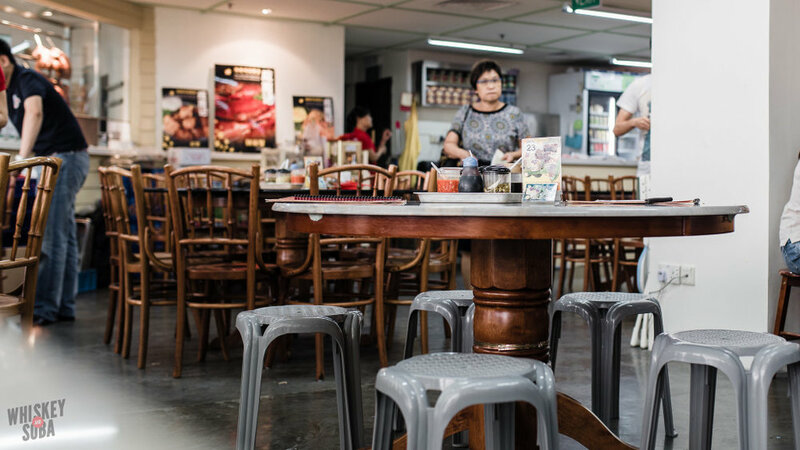 The guide books & blogs say to go to Maxwell Food Centre and go to Tian Tian Chicken Rice. You can do that, if you want. The result will be you waiting in line for 30-45 minutes in the sweltering tropical heat of Singapore, then fighting to find a table, then sweating even more as you eat your spicy chicken rice (because you are dipping it in the chili sauce, right?). Or you can go to the Marina Square mall—you're in Singapore, so I'm sure you're shopping—and eat great chicken rice in an air-conditioned restaurant. 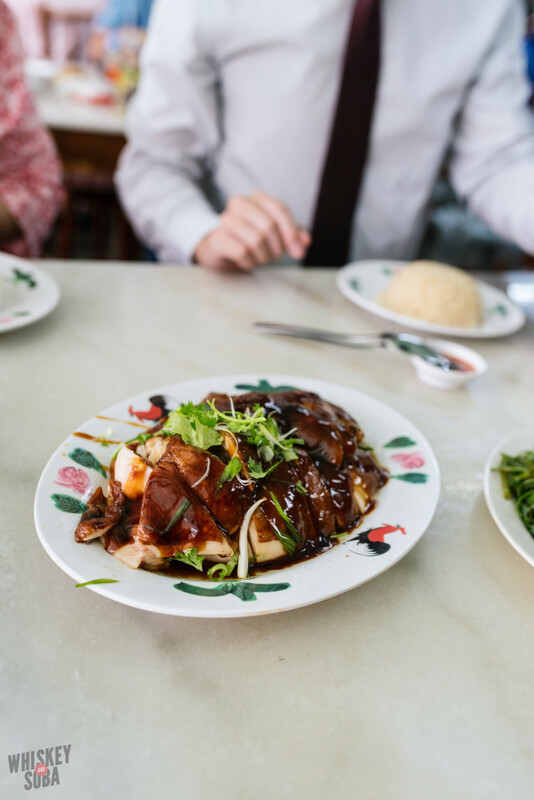 It's not like you can tell the difference between Tian Tian and any other decent chicken rice anyway, right? The other nice thing about going to Wee Nam Kee (WNK) is that since it's an actual restaurant, they have a decently sized menu, and everything I've had there has been pretty good. Service is consistently terrible, but I almost like it more because of it. No waitress is coming to your table without you flagging them down. Most orders are answered with a grunt. Maybe smiling isn't allowed here? After trying most of the menu, our standard order became half a roasted chicken in their sweet-savory soy sauce, kang kong greens in sambal, and cereal prawns, which is exactly what we got this last trip. Once you place your order, you'll get a little sauce bowl and a tray of condiments. This includes a thick chili sauce, pounded ginger, pickled green chilies, sticky dark soy sauce, plus normal soy sauce. Everyone has their own chicken rice sauce preference. You'll see from my bowl below that I try to go half ginger, half chili, then a quick dab of the dark soy. The result is spicy, sweet, and it has that bright ginger burn. Perfect. I'm not sure if it's a total ang moh move or not, but I like to take my sauce mix and pour it all over my fatty, chicken stock cooked rice. That way I can get all the flavors in every bite. Just look at that chicken. 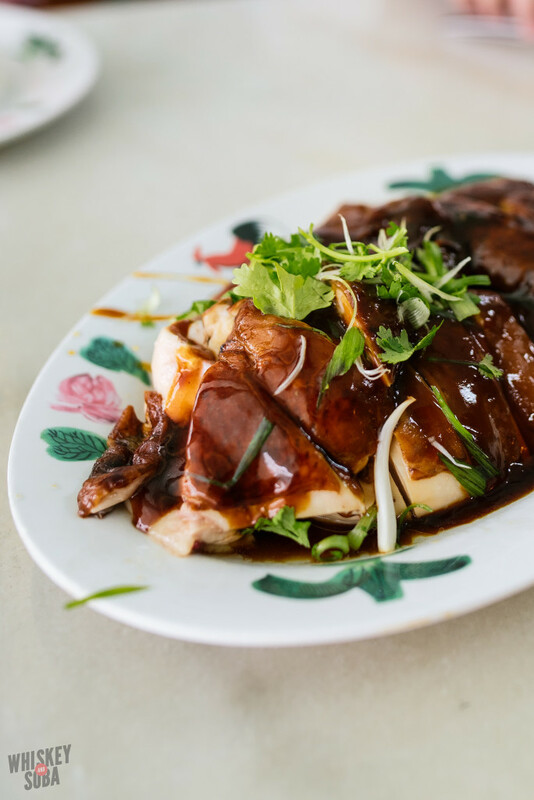 You're not getting chicken that pretty at the hawker center. The roasted skin has this delicious flavor of, well, chicken skin, plus the soy. The meat is as tender as any chicken I've had before. I give it a good dip in the soy, then I drop it onto my plate so I can scoop it up with my now disgusting looking sauce and rice mix. 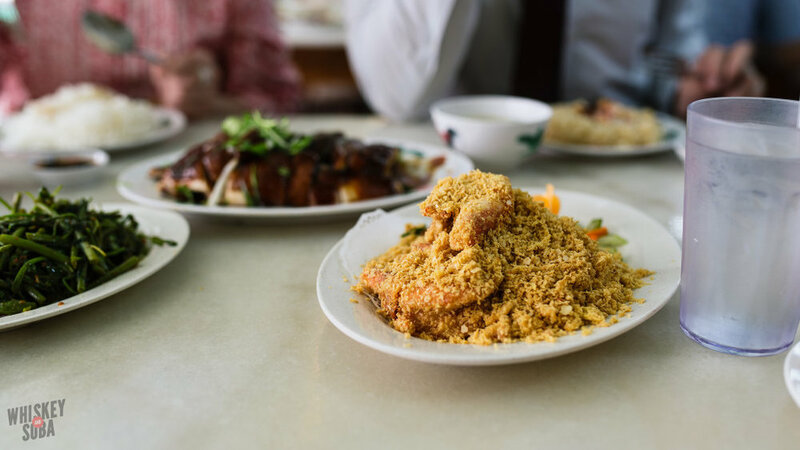 It's truly one of the best bites you'll have in Singapore. Wee Nam Kee's sambal kang kong is something I've never been able to replicate. Sambal is a spicy paste that everyone makes a little bit differently. Shrimp paste is a component in it, but WNK's is light on the shrimp, heavy on the chili. Most jarred sambal you find here in the US has that really strong shrimp paste smell and taste to it, which I think ruins the delicate flavor of the greens. Kang kong, sold in the US as Chinese spinach or water spinach, is simply stir fried in the sambal. Restaurants in the US need to add cereal prawns to their menus, pronto. All you do is deep fry some big ol' prawns, then set those aside. Then they take dry cereal and cook that with a shitload of butter, bird's eye chilies, and curry leaves. The hot prawns are then tossed in the cereal, et voila. Cereal prawns will forever be one of my favorite guilty pleasures. They check off the whole list! They're sweet, salty, spicy, crunchy, and even a little floral thanks to the curry leaves. After the prawns are gone, I just pour the leftover cereal into my spicy chicken rice mush and spoon that into my mouth. Then I go home and nap for four hours.